Probably the most dominant oceanographic feature of the western North Atlantic Ocean is the Gulf Stream. The northern edge of that current is clearly visible in the chlorophyll field measured by SeaWiFS. As the Gulf Stream flows eastward it forms meanders that occasionally pinch off to form clockwise-rotating warm-core rings to the north and counterclockwise- rotating cold-core rings to the south. Cold-core rings generally have higher chlorophyll concentrations (and lower surface temperatures) than the surrounding water. 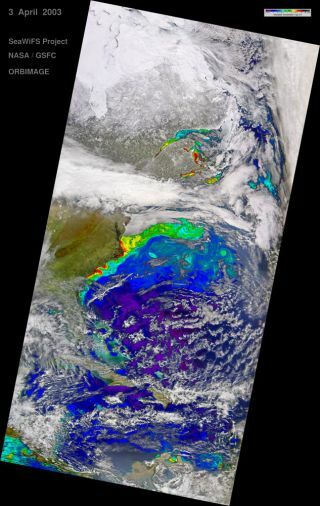 Remote sensing of ocean color is a currently well-established science that provides information about water composition and the depth of light penetration based on the ocean color, as seen from space. Ocean color satellites are part of an Earth observing system and, due to the importance of this system in understanding the state of the ocean and its evolution, the international scientific community has agreed to joint efforts to keep a constant constellation of ocean color satellites orbiting our planet. The first of those ocean color sensors was the CZCS (Coastal Zone Color Scanner) Experiment, launched by NASA in 1978 onboard the Nimbus-7 satellite as part of a proof-of-concept of the capability to measure suspended and dissolved particles in ocean waters from space. Photosynthetic pigments were the main focus of this pioneering mission. Quantifying and monitoring those pigments is essential to understand the systemic functioning of our planet, since photosynthesis is the process responsible for turning carbon dioxide (CO2) into our breathable oxygen (O2) and for the planet's primary production that sustains the trophic web (the food web). In this way, plants and microalgae provide food and air for most of Earth's life forms, especially the macroscopic forms such as animals, obviously including humans. Maintaining ocean color space-borne platforms in orbit is a goal, since scientists want to observe the ocean over long periods of time. Recently, Brazil and Argentina joined this international constellation to provide valuable data and help to prevent another ocean color data gap. The mission is called SABIA-Mar, an acronym which means Argentinean-Brazilian Satellite of Environmental Information of the Sea (the name works both in Spanish and Portuguese, the official languages of the respective countries). The name "Sabiá" means "truethrush", a group of birds form the genus Turdusthat are common in the region of Argentina and Brazil. A large aquamarine-colored plankton bloom is shown stretching across the length of Ireland in the North Atlantic Ocean in this image, captured on 6 June 2006 by Envisat's Medium Resolution Imaging Spectrometer (MERIS), a dedicated ocean color sensor able to identify phytoplankton concentrations. The SABIA-Mar mission is an initiative of Agência Espacial Brasileira– AEB (Brazilian Space Agency), Instituto Nacional de Pesquisas Espaciais- INPE (National Institute for Space Research), both from Brazil and CONAE Comisión Nacional de Actividades Espaciales (National Commission of Space Activities) from Argentina. Its technical characteristics are still a matter of discussion, so these institutions put together a workshop in Buenos Aires (March 14-15th of 2013) and Brasília (May 13-14th of 2013) the capitals of Argentina and Brazil, respectively. The workshop community was composed of government and private institutions from both countries, and now the greater international community of potential users of the satellites is also being asked to contribute and provide their critiques and demands. "The satellite must supply the highest number of demands as possible." says Petrônio de Souza, Director of Space Policy and Strategic Investments from AEB. "It is necessary to know what the future SABIA-Mar users need," reaffirmed the Brazilian Manager of the mission, Marco Antônio Chamon, during the workshop in Brasília. As is usual for most of the other ocean color missions, the data will be available for free to interested users worldwide. The main decision from these meetings was the agreement on splitting the SABIA-Mar mission into two satellites: one focused on imaging the global oceans, expected to launch in 2018, and another for regional studies, planned for 2019. The actual objective of this space mission is to better understand the Earth's carbon cycle, as well as to help fisheries and aquiculture, detect and monitor pollution and harmful algal blooms, follow species at risk, evaluate water quality and water visibility, and study climate and environmental changes. The mission will also aid coastal management efforts and national sovereignty and defense measures. But while we can observe the ocean in the present, we also need to envision the ocean in the future. Ocean color remote sensing naturally is a space-borne vocation, and the discoveries of Earth possibly could be extrapolated to other planets and moons inside and outside the Solar System. Perhaps remote sensing of Earth will inspire future missions to observe the frozen ocean of Jupiter's moon Europa and the hydrocarbon lakes of Saturn's moon Titan in the coming decades. A colorful summer marine phytoplankton bloom fills much of the Baltic Sea in this Envisat image. While individually microscopic, phytoplankton chlorophyll collectively tints the surrounding ocean waters, providing a means of detecting these tiny organisms from space with dedicated 'ocean color' sensors. The knowledge gained from the ocean color science may also help astrobiologists to hunt for extraterrestrial life. Ocean color is presently the only way to monitor phytoplankton from local to global scales, and its variation in density and composition through several time scales. Scientists are currently identifying the range of sunlight absorption by each photosynthetic pigment known to exist on Earth's plants and algae. Future optical sensors onboard deep space satellites or probes may look for those pigments in the nearer exoplanets. While still a matter of speculation, if such sensors turn out to be possible, the big distances involved will demand a much higher precision and accuracy than what the present ocean color science state-of-the-art technology has. Photosynthetic pigments are the result of an evolutionary adaption of Earth's life to the available light, and depend on the Sun's distance, age and magnitude. Astrobiologists are now considering other possible photosynthetic pigments adapted to different types of stars and distances from them. For example, the forest and algae colors of other worlds may be very different than our green patterns. We can assume there could be extraterrestrial habitats verging into red and yellow colors, for instance. By better comprehending terrestrial life and considering the biochemical possibilities, we should be able to explore whether some of our closest neighbors may harbor extraterrestrial life "as we know it," or at least, what we can assume alien life may possibly be like. Follow SPACE.com on Twitter, Facebook and Google+. Original article on SPACE.com.